GAINESVILLE, Fla. -- Beau Layne defeated Bob Malloy for his second career win, the other in Phoenix three weeks ago. 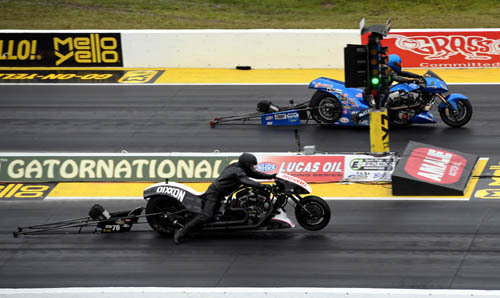 He qualified in the number four position with a 6.300 second pass at 230.72 mph. He defeated Mike Scott in round one and the number one qualifier Takeshi Shigematsu, when he was unable to make the call after a major engine explosion in round one. Layne took the point lead after round one when Doug Vancil was defeated. Malloy qualified sixth and defeat Tii Tharpe and Rickey House to advance to his fourth final round. Takeshi Shigematsu set the Top Fuel Harley E.T. 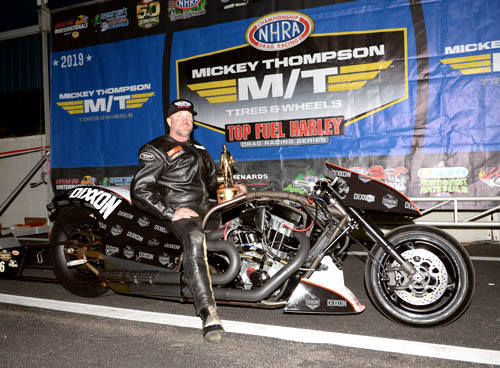 record with a 6.101 second pass the quickest pass in history of Top Fuel Harley. Doug Vancil Set the Top Fuel Harley speed record with a 237.00 mph pass the fastest pass in the history of Top Fuel History.